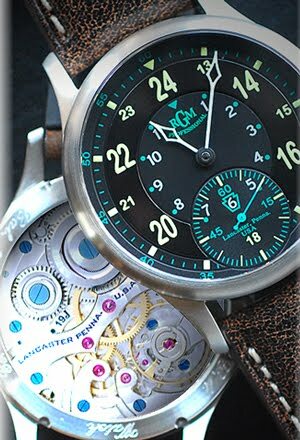 The customer can choose to emphasize 24-hour time, 12-hour time, or elapsed 60 minutes ,simply by the selection of dial. 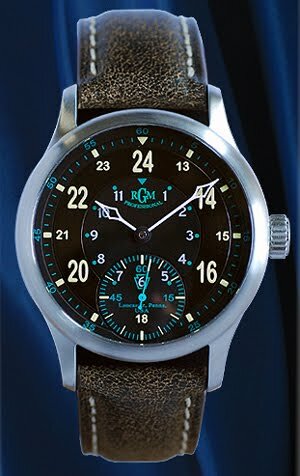 A large subsidiary seconds chapter aids in marking time accurately, and subtle details such as the Keystone logo and signature at 6:00 indicate the pride that RGM takes in manufacturing its components, and assembling the watch, in Pennsylvania. 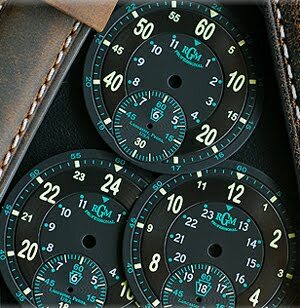 Dial: Option 24, 60 or 12, Black Dial with Luminous. Strap: Option of Bomber or Apache Distressed Leather.